Barbara Ann Scott with her flying instructor. Noel Bart, “Skating sky skipper.” Skyways, April 1949, 28. Hello there, my reading friend. As we all move along the month of April, enjoying the rites of spring, yours truly thought that a feel good story might not be a bad idea. What say ye? Good. Let us proceed then. Once upon a time, in late 1946 or early 1947, a number of teenagers and young adults, both female and male, were taking lessons at a skating school. Many of the male skaters were taking flying lessons, or already had a pilot licence. Some of these young men openly bragged about their flying abilities and generally acted superior. Women, more than one said, could not fly. An 18 year old female skater took umbrage to this behaviour. Convinced that she could be as good a pilot as any of these annoying young men, she began to take flying lessons, in secret. After only a couple of hours in the air, the instructor was so impressed that he told her to take control of the light airplane they were flying in. The young woman was both surprised and delighted. Said young woman was, you guessed it, Barbara Ann “B.A.” Scott, and... Why the shocked look, my reading friend? Her name was front and centre in the caption of the photo at the top of this article, was it not? By the time Scott made her first solo flight, many of her skating friends at the school knew what she was up to. To her great surprise, several of them showed up on that great day. The solo flight began swimmingly. As she prepared to land, however, Scott thought the view over the nose of the light airplane was not quite satisfactory. She opened her door a little bit and leaned out. Moments later, the light airplane touched down and ran into a large muddy area. A startled Scott got a face full of mud. The light airplane bounced 3 times before coming to a stop. Scott’ skating friends were both cheering and laughing. The laughter grew louder when she stepped out of the aircraft. Although quite angry, Scott quickly acknowledged that the situation was, in fact, quite funny. Soon after, Scott visited some friends in the United States. She used this opportunity to practice her landings. Scott easily obtained her private pilot’s license not too long after. Scott was very famous by then. This exceptionally gifted figure skater won her first national junior championship at age 11. She won her first national senior championship in 1944. Scott won again in 1945, 1946 and 1948. In 1945, Scott won the North American championship, a competition she won again in 1947. In 1945, she was voted Canada’s outstanding athlete of the year by newspaper editors – a first for a female athlete. She won yet again in 1947 and 1948. In early 1947, Scott went to Europe where she won both the European and World championships. Upon her return to Ottawa, Ontario, her hometown, she was given a heroine’s welcome. The city of Ottawa even gave her a brand new canary-coloured convertible automobile. Scott was voted Canadian newsmaker of the year in 1947. She also received life memberships in 6 skating clubs and 2 flying clubs, the Montreal Flying Club and the Ottawa Flying Club. The latter should not be confused with the Rockcliffe Flying Club, located within shouting distance of the Canada Aviation and Space Museum, in Ottawa. 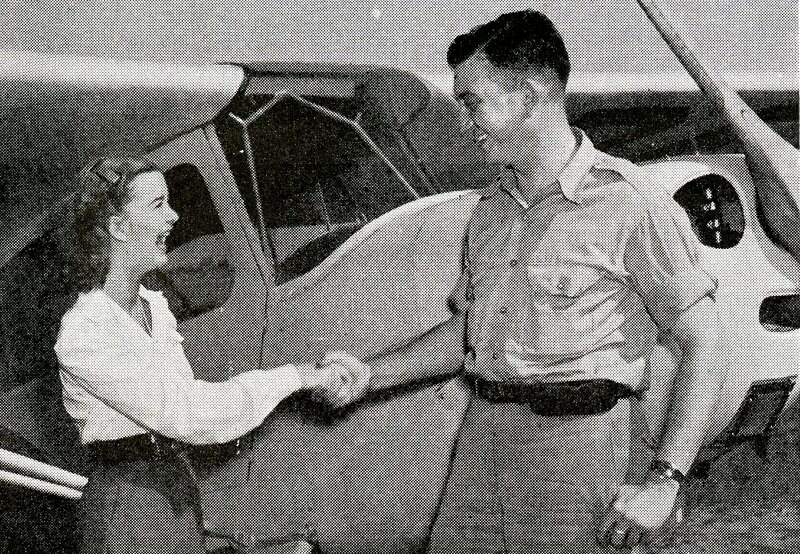 Eager to take advantage of Scott’s fame, the president of Canada’s most important air transport company, government owned Trans-Canada Air Lines (TCA), Herbert James Symington, made her an honorary flight captain around March 1947. The powerful minister of Reconstruction and Supply, and a great defender of TCA, today’s privatised Air Canada, Clarence Decatur “C.D.” Howe, was on hand to congratulate Scott. From the looks of it, Scott never acquired an aircraft, something she had given some thought to. Indeed, one has to wonder how much she flew after 1947, but back to our story. Forced to give up her automobile to retain her amateur status, Scott performed flawlessly at the V Olympic Winter Game, in 1948, despite the poor condition of the rink, located outside and rutted by hockey players. She came back to Ottawa with a Gold Medal, the first and only one to be won by a Canadian figure skater as of 2019, to another heroine’s welcome. Before the year was out, Scott had won the European and World championships for the second year in a row. By Christmas of 1948, a Barbara Ann Scott doll produced by Reliable Toy Company of Toronto, Ontario, from a design by famous German American doll designer Bernard Lipfert, had become a best seller. It was produced for several years, with a new costume each year. These dolls are now collector’s items. Canada’s sweetheart, as Scott was often called, turned professional in June 1948, joining the Hollywood Ice Revue and the Ice Capades, and travelling around North America and Western Europe. Incidentally, the city of Ottawa gave her back the convertible automobile, now painted blue, that she had been forced to return in 1947. Eager to take advantage of Scott’s fame, companies like Canadian soft drinks giant Canada Dry Ginger Ale Incorporated, a company mentioned in a November 2018 issue of our blog / bulletin / thingee, signed Scott up to appear in advertisements. Scott married an American press agent / publicist in 1955, moved to the United States and retired soon after. She was not yet 28 years old. As of 2019, Scott was still Canada’s most accomplished figure skater. While living in the United States, Scott briefly owned a beauty salon. She went on to groom, train and / or ride horses at shows until the mid 1980s. If truth be told, she was deemed to be one of the best riders in that country. Scott also took up golf, a sport at which she proved very good indeed. Oddly enough, she stopped playing after only one year. Scott was widely recognised for her educational and charitable work. She died in September 2012, at age 84. Did this story prove interesting, my reading friend? Good. I am pleased. See ya later. Photos of the celebrated Avro Arrow plus...a disassembled vending machine?